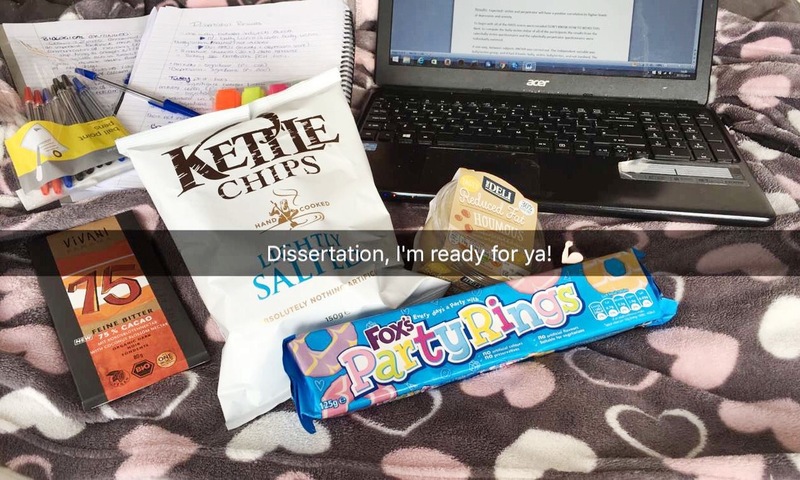 So, I’ve been sitting here doing not all that much really, thinking I’ve got ages until exam- heck, my exam timetable hasn’t even been released yet– when it suddenly dawned on me that I couldn’t remember the last time I looked at my dissertation. Oops. My dissertation is only 6000 words, which is around 4000 less than the average, but I’ve had to conduct a whole study first which I have been more focused on. I already have around 2000 words (mainly because we had to submit a protocol outlining our method, literature review, abstract, and data analysis before Christmas), but I still have 4000 to go and I have a month to do it in. Where does time go really? It feels like only yesterday that I was still deciding on what my research question was going to be and now the deadline is in sight! The other day someone told me to just think of it as two essays and I’ll be fine. In some ways this advice is good because it does put the word count into perspective. However, if I really had two essays due in a month, I wouldn’t have put this much effort into them already. Got my snacks. 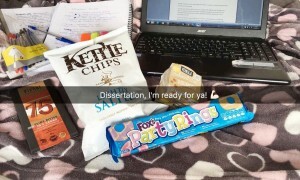 I’m ready for you, dissertation!